Note: This part has free shipping by USPS FIRST CLASS MAIL within the United States. 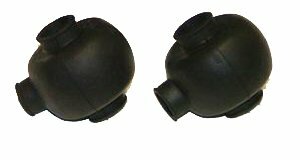 Rod End Boots will prolong life of Rod Ends by keeping road debris out of bearing surfaces and extending the life of the teflon bearing liner. "boots for cfm tubular arms"
Comments: These are a must for keeping debris out of the heim joint's.